C3’s community-engagement programme partners with local communities to identify barriers to good health and use a community’s existing strengths to overcome these barriers. The aim is to make the healthy option the easy option for all. Health interventions are often imposed on communities. What makes our community-engagement programme unique is CHESS™ (Community Health Engagement Survey Solutions). 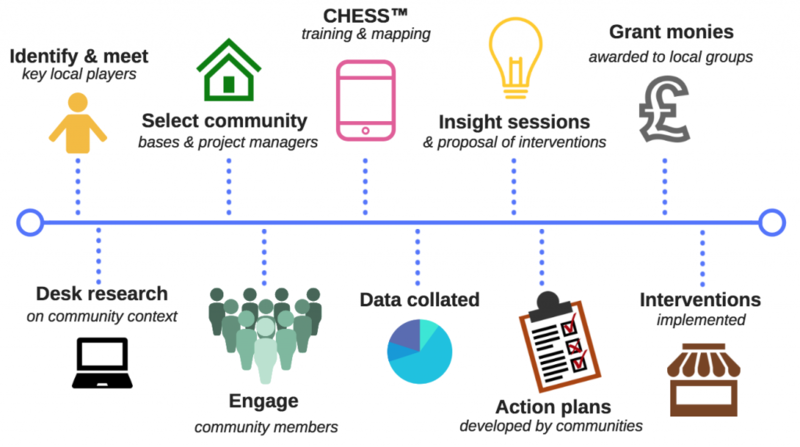 CHESS is an innovative, evidence-based approach that shifts decision-making to local communities by engaging them as ‘citizen scientists’ in an investigation about their health and the built environment (e.g., the shops, restaurants and parks in their neighbourhood). Created by C3’s global health associate Dr Denise Stevens, CHESS includes a mobile tool that equips local communities in identifying and mapping the barriers they face every day when making choices about diet, activity and healthy living. Evidence shows that actively engaging communities in evaluating the challenges and opportunities they face in their day-to-day lives leads to more effective, longer-lasting solutions. Identifying and meeting with key local players (individuals and organisations). Locating local project managers known and trusted by the community. CHESS training and mapping. Community members walk their neighbourhood to record what they see in answer to questions posed by the tool (e.g., are healthy foods available for purchase?). Reviewing through insight sessions the quantitative and qualitative data collected by community members along with vital context about social and health inequalities. Using C3’s public health guidance, community members decide on an action plan of interventions to implement (ranging from small to big changes). Implementing interventions through grants (either through the C3 project or by using CHESS evidence to apply to other funders). Over £2 million awarded to communities from external funders to implement proposed solutions. 2 playgrounds co-designed with local parents, including transforming a disused carpark. 14,000 healthy meals for children provided by Morgan Stanley in east London, based on C3 and the community’s recommendations using CHESS. One-third of Halifax’s Ovenden population engaged (4,000 community members) and partnerships with 18 local organisations. Interventions included classes about cooking, gardening, and wellbeing; community clean-ups; dance sessions; breakfast and tea clubs; geocaching; sports/activity sessions. One-third of Girvan’s Glendoune population engaged (1,000 community members) resulting in the refurbishment and revitalisation of the community centre that was previously set to close. It has improved community resilience and community members feel more confident, with developed networks and partnerships. Interested in using CHESS in your local community? Contact us to learn more. You can also download a leaflet about our community engagement programme to share with your colleagues.